Mitch Fanning is not only a consummate fiddle player, but an inspiring fiddle and violin teacher who can rightly take credit for gracing our area with hundreds of young musicians. He has himself studied violin at Catholic University’s School of Music, where he received a Bachelor’s of Music degree in violin performance in 1982. He studied Irish music with Brendan Mulvihill and others, and in 2014 was awarded a TTCT (Teastas Teagaisc Ceolta Tire), a diploma given to master teachers of Irish music by Comhaltas Ceoltóirí Éireann (CCE), the worldwide traditional Irish music society in Ireland. Mitch is also founder and director of Musical Arts and Dance (MAD) Week, a now-celebrated school of instruction whose faculty, for one incredible week, includes a galaxy of Irish music stars. He also directs The Bog Band, a talented group of young musicians who are “mad for trad” Irish music. 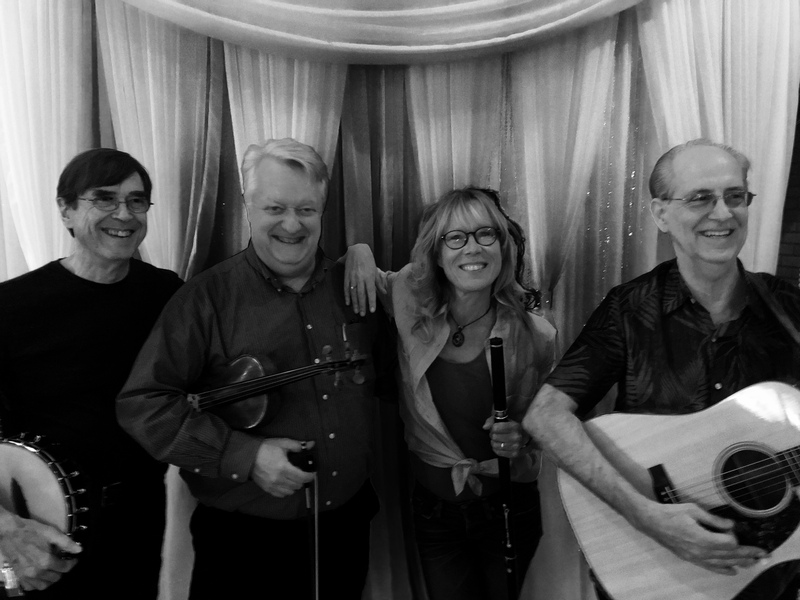 A frequent participant in festivals and sessions in Ireland, Mitch performs closer to home at events throughout the Washington metro area—he can be heard, for example, every Monday night with his fellow “Inn Mates” at the Irish Inn at Glen Echo. Mitch is also a faculty member of Washington Conservatory of Music, where he teaches traditional Irish fiddle classes designed for violinists. Jesse Winch, born and raised in the Bronx in an immigrant neighborhood, is regarded as one of the top bodhran (Irish drum) players and teachers in traditional Irish music. He also plays bouzouki, guitar, and harmonica, and was a founding member of Celtic Thunder. Jesse is a founding member, with his brother Terry, of the award-winning band Celtic Thunder, and also plays regularly in the DC area with Narrowbacks and the Flaming Shillelaghs. He has served on the teaching staff at the Augusta Heritage Center’s Irish Week in Elkins, WV, teaching bodhran and ceili band; at the Swannanoa Gathering’s Celtic Week in Asheville, NC; at the Annual Convention of the North American Province of CCE; and regularly for the Washington Conservatory of Music at Glen Echo Park, Maryland. Jesse, former cathaoirleach (chairman) of the O’Neill Malcom Branch of CCÉ, was elected to the CCÉ Mid-Atlantic Region Hall of Fame in 2012. Tina Eck plays the Irish wooden flute and tinwhistle. Originally from Germany and now working as a Washington-based radio news correspondent, she discovered her passion for Irish traditional music in a local pub in Washington DC in the 1990’s. She has since performed at countless sessions, festivals, dances and concerts, including such notable venues as the Irish Embassy, Strathmore Hall, Capitol Hill and the Kennedy Center. She has traveled to Ireland frequently and has learned technique and repertoire from some of the best traditional flute players in Ireland and the U.S. She is on the faculty of the Washington Conservatory of Music at Glen Echo Park, and she also gives private flute and whistle lessons. In 2011 Tina was awarded a Maryland State Arts Council Grant for Solo World Music Performance. Tina also holds a 2013 TTCT Teaching Diploma from CCE, identifying her as one of the premier teachers of Irish traditional music. Tina also performs with the bands Rambling House, The Flaming Shillelaghs and the duo Lilt. She lives in Cabin John, Maryland. Guitar and bouzouki player Zan McLeod’s musical heritage began with his grandfather, Ed Stacy, who played Appalachian music on the banjo and mandolin. Zan, a North Carolina native, started his own music career playing in the style of the great Southern Rock bands of the early 70s. In 1979, on a trip to Nashville, Mike and Zan met Triona NiDhomnaill of the legendary Bothy Band. Together Triona and Zan formed the innovative and groundbreaking band Touchstone. In 1988, Zan moved north to Washington DC. There he connected with his Irish musician friends again and began an exciting and hectic 10 year period of touring and recording. His solo CD, Highland Soul, was recorded by Zan, and its success inspired him to become an audio engineer. Upon graduating from the Omega School of Recording in 1997, he created and established his own home studio, Tonehouse. He has produced more than twenty CDs at Tonehouse for many of Washington’s emerging local artists. Zan performs as a freelance musician with many of the most talented and innovative musicians around. Zan is also a respected and experienced workshop leader and instructor. He has taught for years at Augusta Irish Week, Gaelic Roots at Boston College, Common Ground, and the Swannanoa Gathering.